Following the “It’s Not Rocket Science” theme, the following statement can not be argued against – metallic manhole or service covers, offer almost no traction, and are slippery when wet. 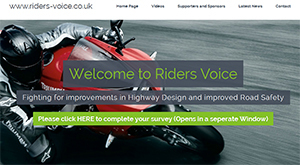 The latest addition to helping “fight” for improvements in Highway Design and thus improved Road Safety is the “Riders Voice”. The Riders Voice has taken action to investigate the causes of accidents and to provide statistical analysis surrounding the whole highway defects problem via an on-line survey. By submitting, anonymously, details of your accident, however large or small and regardless of the damage/injury caused, you will assist Riders Voice in lobbying for change, with statements that address the actual condition of our highways and with statistics that support the needs of decision makers, who in turn will hopefully bring about change. 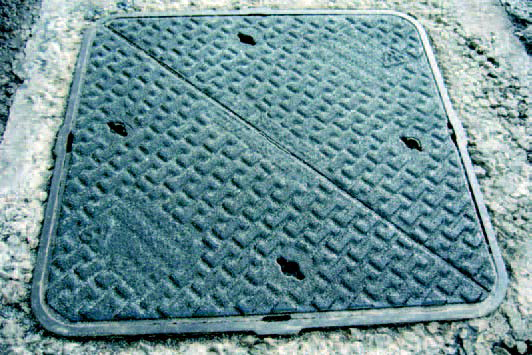 However physically there are options available to road authorities and agencies to improve and maintain a skid-resistance that stops manhole/service covers from remaining slippy. 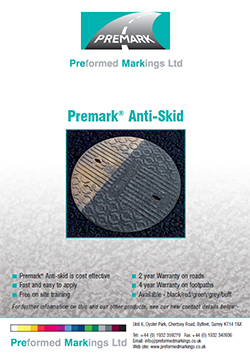 The latest products that we have been made aware of is “Premark Anti-Skid” which you can read about below. These compliment previous products, “Grip Top” – “TUFTAC” and the promotion of a composite cover by a motorcycle riders campaign “Get A Grip”. In August 2007 the British Motorcyclists Federation (BMF) produced a document on Manhole Covers and covered the issue of European Standard EN 124 that manhole covers are manufactured but the standard doesn’t specify minimum grip levels. 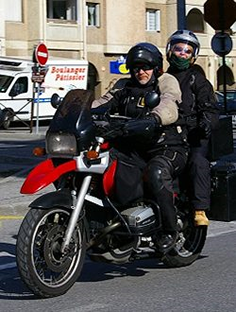 In October 2007 the Federation of European Motorcyclists’ Association (FEMA) responded to a consultation regarding CEN124 to amend the standard to require the use of covers with acceptable in-service skid/slip resistance. FEMA pointed out that covers are designed for durability in terms of mechanical stability, i.e., they do not break, deform, or displace, not for adequate and sustained levels of skid resistance. Adding that where grip is required, the standard recommends a texture be applied to the cover. However, in use, the skid resistance of many covers deteriorates rapidly as they become polished by passing traffic. This results in a cover with poor skid resistance compared to the surrounding highway. FEMA stated that they believed that the surface of the highway should not present avoidable hazards to motorcyclists. That the hazards presented by slippery manhole (inspection) covers are entirely avoidable. The use of covers with acceptable in-service skid/slip resistance could be mandated by the European Standard as a contribution to the EU commitment to reducing road casualties. Since then it has all gone quiet until Premark made us aware of the work on that they are doing at this standard level. Premark Anti-Skid”, is also working with the service cover industry to try and get an enhancement (adding to existing covers) accepted as a standard requirement. The standard for covers has been under review since 1999, and is now in its final stages, but the latest draft has greatly reduced the originally proposed Skid Resistance Value (SRV) for covers. “Premark Anti-Skid”, which is a high performance anti-slip material that works extremely well on steel and iron, is the latest of these products that we have been made aware of. Grip Top is a solution that has been around for a few years and has now received a Prince Michael International Road Safety Award. For motorcycles, scooters and bicycles that are particularly vulnerable to loss of control, from sudden changes of available grip, especially while cornering or braking, or insufficient grip in high demand situations such as sudden braking or swerving to avoid collision, “Grip Top” offers levels of grip comparable to other road surroundings. The adoption of ‘Grip-Top’ in high risk situations such as bends, roundabouts, traffic lights and other areas where bikers and cyclists typically lose control and become casualties would reduce risk in such danger zones. The development team of this unique product comprises Saint-Gobain Pipelines for the ironwork, Stirling Lloyd for treatment surface technology and Bristol City Council for the road trials and assessments. TUFTAC is a ductile iron manhole cover and frame, which is inset with an industry unique, special mastic asphalt (MA) formulation. The ductile iron cover and frame are designed to pass the statutory highway loading requirements but unlike convention ductile iron covers that have a dangerously low skid resistance, the MA surface has a high skid resistance at least equal to the surrounding road surface. The Motorcycle Action Group (MAG UK) previously launched a “Get A Grip” campaign. The campaign concentrated on the issue of grip on and worn out inspection covers across the UK and heavily promoted Structural Sciences Limited SSC composite access covers, as an only solution. The claim for the covers was that they offered a permanent anti slip surface which lasts 15 years. The national campaign saw some success in getting local authorities in Great Britain to trial the inspection cover. Raises awareness of road surface safety issues. Works with relevant organisations to create a safer environment for riders. Campaigns for higher grip, cost effective, road surfaces. The IHIE Guidelines for Motorcycling, which we understand Northern Irelands Roads Service takes notice off, sets out several times the issue of Manhole Covers or Service Covers – Utility Covers. When redesigning an existing layout consider the position and level of utility covers, especially on bends and within braking or steering areas. Avoid forcing riders to over-run them whenever possible. If it is unavoidable, use covers with a skid resistance similar to the surrounding road surface. Service covers and gully gratings. Locating ironwork out of the wheel tracks of twin track vehicles or on the outside of bends can place them on the line used by motorcycles. This presents a sudden change in road surface properties leading to stability problems. It should also be noted that water on service covers freezes sooner than water on the surrounding road surface. If the cover cannot be moved, it should be provided with a surface finish compatible with the skid resistance of the surrounding road. One of the most regular problems raised by motorcyclists is that of service covers. Designers and maintenance engineers should take every opportunity to assess the use of steel service covers in the carriageway and, where relocation is impossible, consider replacement with high skid resistance covers. The most difficult sites are those where the cover lies on the riding line during a change of direction, either turning a corner, rounding a bend or at roundabouts. Proposals to position new covers within the carriageway, especially at roundabouts, should be discouraged. The British and European Standard on service covers is under review with the intention of including a requirement for enhanced skid resistance. Anti-skid surfaces can be retro-fitted to covers that cannot be relocated. Where utility companies intend renewal of apparatus in the road it should be suggested to them that new covers should be a “skid proof” type. In new developments the local authority should advise on the location of covers and perhaps specify that they are located in service strips in the verge/footway as opposed to the carriageway. Details and link to “Get A Grip” campaign – see above! I note the comment above …. ‘it’s all gone quiet’. Trust me, it hasn’t. We have been lobbying for a change in the slip resistance of utility ironworks for nearly four years. It would seem that some authorities are looking into the this issue, but the restrictions in budgets have stopped them dead, in their tracks. Alternatively, please email the UK distributer of the material. They will assist you in lobbying your local authority for change. 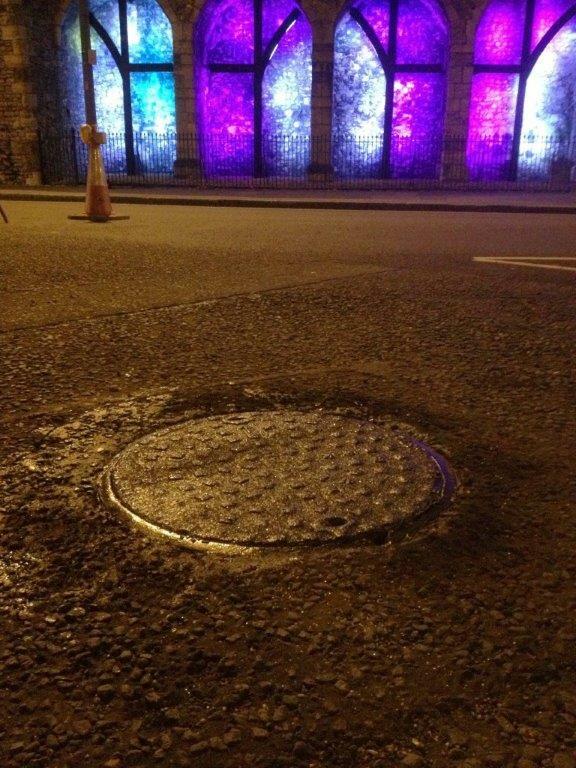 South Worcester council are to investigate the use of Premark Anti-Skid on polished manhole covers in the region. Thanks Andrew for the update will definately have a look into this. 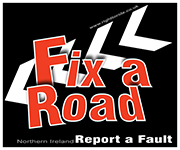 And perhaps an article on Premark Anti-Skid and worthwhile letting our authorities in Northern Ireland know. For Southhampton might be worthwhile getting in touch with the local Motorcycle Action Group (MAG UK) group in the area – Southhampton MAG MAG Nationall has a Get A Grip Campaign. A review of the standard for highway service covers is currently being undertaken. The proposed skid resistance value for iron covers is, in my opinion anyway, extremely low. As a manufacturer in this industry, we will be lodging an objection to the performance criteria suggested by the review committee, to ensure that new covers are safe for motorcyclists. I think we also have to be realistic that this will only affect new installations and not existing covers which may not be replaced for another 10 years. These covers need remedial treatment to enhance their performance, but we have to be equally sensitive to the costs of such a scheme. I would welcome the opportunity to provide an article with some insight into cost effective retro-fit solutions, using Premark, a high performance anti-slip material that works extrememly well on steel and iron. I recently presented at the National Motorcycle Conference arranged by AIRSO and to be honest, the reaction was amazing. We are currently dealing with a large number of Road Safety Officers throughout the country, and with support from motorcycling associations and organisations, we can all make a difference. Personally I think this is a good idea, so often i am concerened, particularly in wet road conditions, when I am confronted with a manhole cover in my path, more so on a bend. So I would welcome anything that makes it safer for me. However I dont think that its been thought through enough. There I am on a wet road, making my way round a corner or bend and in front I am confronted with a replaced mahole cover that looks like a manhole cover and is a similar colour to the surrounding tarmac. I ask myself is it an old slippy cover or one of the new anti skid ones. Am I safe to ride over it with lean angle or should I avoid it at all costs. No I dont need a sign being erected informing me that its a new one but hows about making it coloured so that it stands out as the anti skid one, it could be green or orange or any colour so long as I can identify it as being safe and not dangerous. Am I talking pie in the sky or what? One for Neil Fagan. I have sent a picture to the administrators of Write to Ride. We have recently treated a test cover in Southampton. I am sure you will recognise the area when you see the picture. Premark® Anti-Skid treatment to a cover in Southampton. Thanks Andy see comments below! Please do not disregard my remark or suggestion that whatever covers the grid or manhole cover that it be easily identifyable as anto slip and therefore safe for a twv to ride over, be it on a straight or on a bend. There is nothing worse than being confronted by such a danger and without a different colour the twv rider will try to aviod it which could mean losing control of his/her machine. IT NEEDS TO BE COLOURED. I have to agree with Bob Craven, in part at least, in that riders generally try and avoid such obstacles. If they were coloured, the rider would be better prepared for the obstacles ahead, and will adjust their ride style to suit. Alternatively, if they miscalculate their ride line, and travel over the covers, being treated and better performing will at lest support the rider and his vehicle until such time as his line is corrected. For the minor cost of improvement, the highways authority should specify a minimum standard for safety, not rely on a weak standard within the service cover industry. The traditional Cast Iron Manhole cover has been around since the early 1900s and over the decades Cast Iron has proven to be the most cost effective, durable and resiliant of materials to apply to this use. In recent decades the “recipe” has been tweaked which has strengthened them further with a degree of weight saving. In very busy urban areas the ‘grip’ surface cast into the cover will eventually wear away, becoming smoother and smoother – over a 30 year period or more, dependant on location. This does little to diminish their strength but the term Worn Out would apply and it is indeed interesting to see that there are products and methods being introduced to combat the risk that a Worn Out cover presents to any wheeled vehicle, particularly to, presumably. anybody on 2 wheels – powered or not. In pedestrian locations this can mean a lifetime in excess of 100 years! However the Worn Out definition applies ONLY to the surface and to the canny Road Authority they can be ignored as they still maintain their original purpose and strength is not compromised by the worn surface. 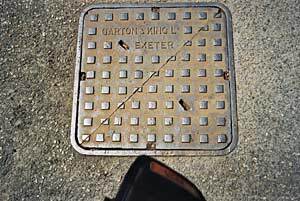 In my part of the world the family business cast hundreds of thousands of cast iron inspection and manhole covers from the 1900 to 1980 (http://www.exeterfoundry.org.uk) and they litter the highways and byeways of the westcountry, particularly Devon and specifically the Exeter Area. My observation is that there are more covers in city and urban areas (where utilities are often directly under the road surface) and less in rural areas and even less on Trunk Routes. Urban areas are inevitably regulated by speed limits and the introduction of 20mph areas is prolific. I’m sure Highway Authorities should be harassed to attend to very worn covers (we pedestrians can slip too you know!) but surely far greater attention needs to be brought to the atrocious state of many of our roads and the proliferation of potholes and breaking up road surfaces caused by frost & water damage and neglect. The ubiquitous manhole cover when worn however does present a hazard it seems, even though the area of tread on a tyre in contact with a worn cover is greater than that on one that isn’t?! Until the worn cover is treated or replaced it seems that the wheeled road user in the 21st century must continue to do what his predecessor did throughout the 20th century – beware and be aware.